For thousands of years, the coconut palm has entwined itself in history, from tropical coasts to typical shelves in global groceries. Called the “tree of life” by the many cultures that have depended upon it through time, it provides sustenance, succor and shelter. While it now grows on every subtropical coastline around the world, genetic testing underwritten by the National Geographic Society in 2011 showed the coconut originated in India and Southeast Asia. From its original home, the nut—which can float—made its way independently, traversing both hemispheres. But historians also agree that coconuts traveled at the hands of men, and it was most likely seafaring Arab traders who carried coconuts from India to East Africa as much as 2,000 years ago. Even the name they conferred on the fruit— zhawzhat al-hind, which means “walnut of India”—survives in Arabic today. 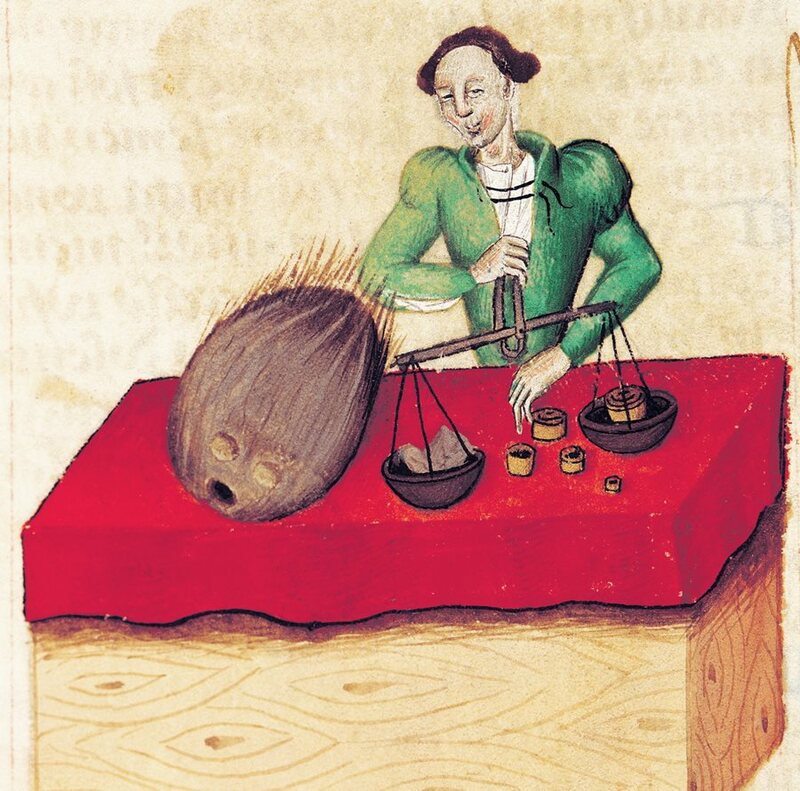 The cocuruto (“crown of the head” in Portuguese), from which the South Asian drupe takes its modern name, was hinted at in the illustration at left printed in a 15th-century edition of Dioscorides’s Tractatus De Herbis; the merchant’s scales allude to the coconut’s value in Europe. 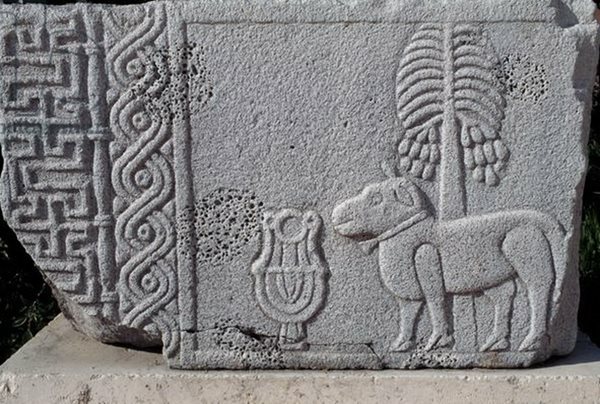 Carried much earlier by Arab traders into Mesopotamia, a coconut palm was depicted in a bas-relief, in the Aleppo Archaeological Museum. These mariners encountered coconuts as they traded with their Indian counterparts who sailed small, nimble dhows, coast-hugging boats made from teak or coconut-wood planking lashed together with coconut fiber (coir). The dhow was adopted by Arab merchant mariners themselves, and the boats continue to be made today, but with modern materials. Beginning in the early 16th century, the coconut came to Europe through the “maritime Silk Road” following explorer-colonizers like Vasco da Gama, who pursued a direct trade route between Portugal and India, guided by maps and navigational information charted by the famed Arab navigator Ahmad ibn Majid a half century before. From da Gama and other Portuguese traders came the coconut’s contemporary and most recognized international name: They called it coco-nut because it resembled a cocuruto, or skull, with three dots on its end like two eyes and a mouth and coconut ﬁbers that resembled hair. Coconuts are the fruit of the palm trees. And as we have bread and wine, oil and vinegar, so they get all these things from the said trees. With two of these palm trees, a whole family of ten can sustain itself. The coconut trees last for a hundred years. 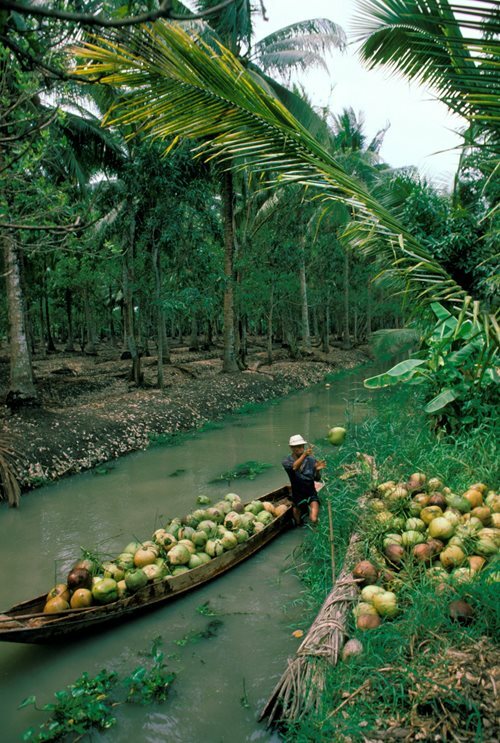 A boatman in Thailand offloads fresh coconuts that will be consolidated for onward shipping to meet rising global demand. At home, Europeans found it useful for both food and decorative items. Sixteenth-century Europeans believed that coconut shells had magical healing powers, and they fashioned them into elaborate goblets inlaid with precious metals and gemstones. This practice continued well into the 19th century. It was the darker side of the European sea trade that took coconuts to what are now the Americas. To the Caribbean, coconuts came with colonialism and the slave trade (which also brought numerous indentures from India), and it thrived in the region’s moist, subtropical climate. Cocos nucifera are drupes—a category of fruit that includes dates, olives, black pepper, various nuts and “stone fruits” like peaches, plums and mangoes. Unlike them, however, the uses of coconut palms go far beyond the fruit’s edible white ﬂesh and clear water. Since antiquity coconut palms have been used for their wood, oil, sap and coir. But it’s particularly in the Western world that around four years ago professional and top amateur athletes began drinking coconut water for its natural electrolytic properties. Since then, coconut water has been heavily marketed as a beverage, and since 2013 consumption rates have been rising by double digits. Since 2015, export of fresh coconuts by the Philippines—the world’s biggest producer—has gone up more than 80 percent. 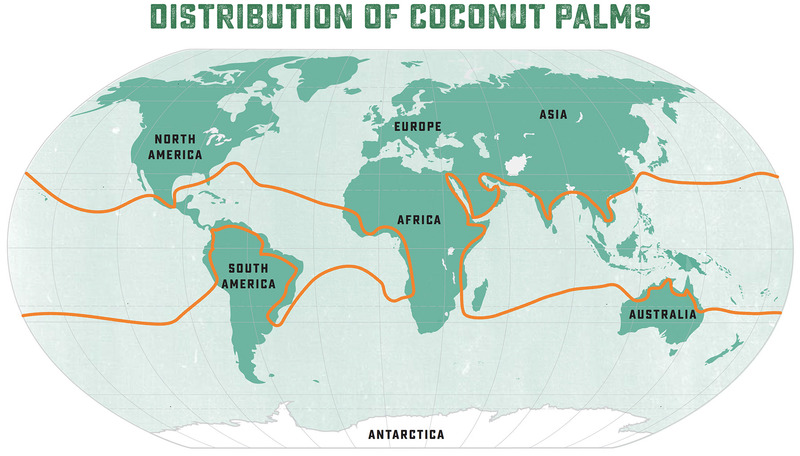 Coconut production, export and processing have become a multibillion-dollar global industry. Much of the new interest comes from the West where marketing aimed at health- and exercise-conscious consumers took sculptural form on a bridge in London, and new products—especially beverages and oils—line the shelves of high-end grocery chains. For the first time since Arab traders loaded up all those centuries ago, the coconut, in all its processed variations—fresh, frozen and dried; milk, sugar, oil and syrup—has once again become a global “it” ingredient, not restricted to niche producers but a proﬁt-maker for the largest food producers worldwide. As it inches its way further into the Western mainstream, including health and beauty and even household-cleaning products, coconut is following its oldest pattern of sustaining many aspects of life. This is all far less novel in its more native geographies, like South India and Southeast Asia, as well as on East Africa’s tiny island of Zanzibar, Tanzania, where coconuts are a staple ingredient in everything from breads to beverages, from meat dishes to desserts. Here, market days begin with the purchase of coconut and the opening and processing of the coconut into milk. Grating coconut meat is among the first skills passed from mother to daughter. Zanzibari women also find work making rooﬁng material from coconut leaves and rope from its fibers, while coconut oil is important in the blessing of newborns. During Islamic holy days, coconuts and coconut products are among the key food donations to local mosques. The Arab inﬂuence in coconut trade and cultural adoption also endures in North African and Middle Eastern recipes, where it is most often used in ceremonial or special-occasion dishes—a clue to its once-upon-a-time rarity. In Egypt, for example, sobia, a drink enjoyed during iftar, the fast-breaking in Ramadan, is made with a base of coconut milk rather than wheat, barley and oats—grains more popularly used in Saudi Arabia and elsewhere. Senegalese, likewise, enjoy iftar with coconut-rice pudding. 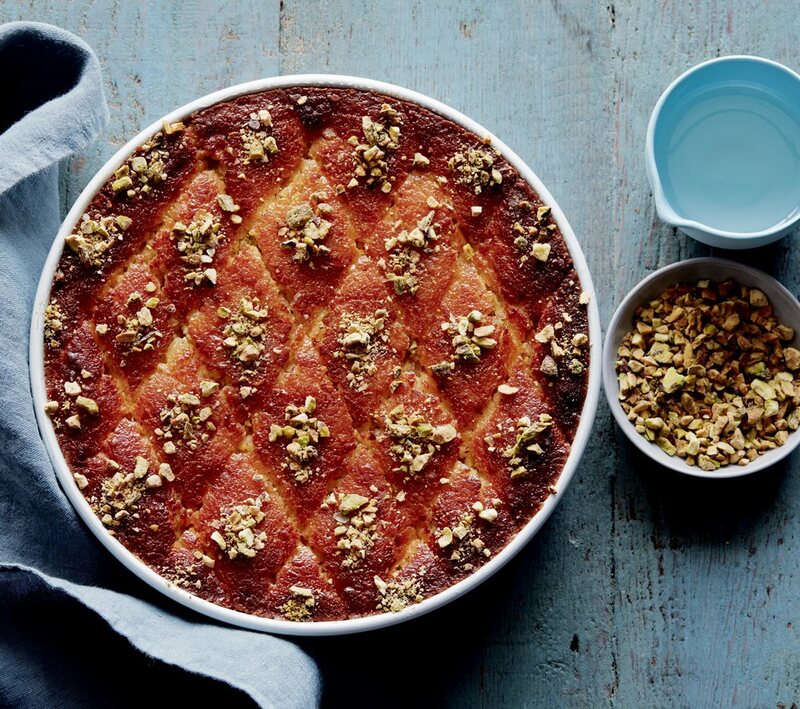 In Lebanon, Syria and Egypt, a semolina cake mixed with grated coconut called hareesh (or basbousa) is popular for all manner of special occasions. In Morocco, the ghoriba, a small coconut cookie, is popular with chai, whereas whole coconuts are processed into snacks that are sold in public markets. Some of these appear in the recipes that follow, designed as a brief culinary journey with coconut through the Arab and Muslim worlds. Hoppers, or appam, are a staple in Sri Lanka and South India. They come in a variety of forms, the most common being a thin, bowl-shaped crêpe with a coconut milk-based egg curry or other topping. They are most often eaten at breakfast. Because the hopper batter needs to ferment, it should sit at room temperature overnight, making it a dish requiring advance planning. But it’s well worth the wait! Start with the hopper batter: Stir together in a large bowl the yeast, sugar and ¼ cup of the warm water. Let sit until the mixture begins to foam and bubble, about 2 minutes. Stir in the rice ﬂour, salt and remaining ¾ cup of water and mix well until the batter is smooth. Set aside to rise overnight in a warm spot and cover with plastic wrap. It should double in size. 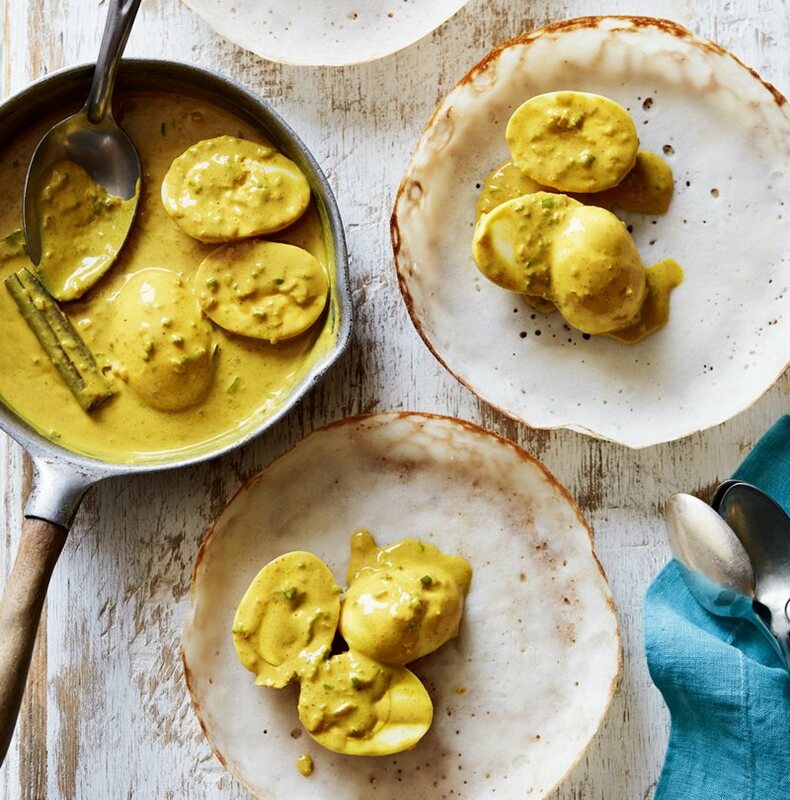 To make the egg curry, heat the coconut oil in a medium saucepan over medium-low heat. Add the shallot and fry until it begins to soften, about 1 minute. Add the curry leaves and fry until they begin to blister, 30 to 40 seconds, and then stir in the fish ﬂakes and fry, stirring, for another minute. Stir in the chili powder, cumin, turmeric and green chile and fry for 30 seconds. Add the coconut milk and cinnamon stick. Bring to a simmer and cook until the mixture begins to thicken, about 10 minutes. Add the hard-boiled eggs and salt and simmer 10 minutes longer. While the curry is cooking, fry the hoppers: Mix the coconut milk and the remaining 1 tablespoon of sugar into the risen batter. The batter should be thin—about the consistency of French crêpes. Add lukewarm water as needed to achieve this consistency. Heat a small wok over medium-low heat and brush with coconut oil. Pour about ¼ cup of batter into the pan and swirl it around so the batter thinly coats the pan, about 20 cm diameter. Cover the pan, allow the hopper to cook for 1 minute and then gently remove. Repeat until all the batter is used. Serve hot with egg curry spooned into the center of the hopper. Sobia is a drink served chilled. The ingredients vary by region and can include barley, wheat and oats as a base and can be ﬂavored with tamarind, cardamom and cinnamon. Garnish with raisins, pistachios or rose petals. This Egyptian version features coconut milk and coconut as both the base and main ﬂavoring. 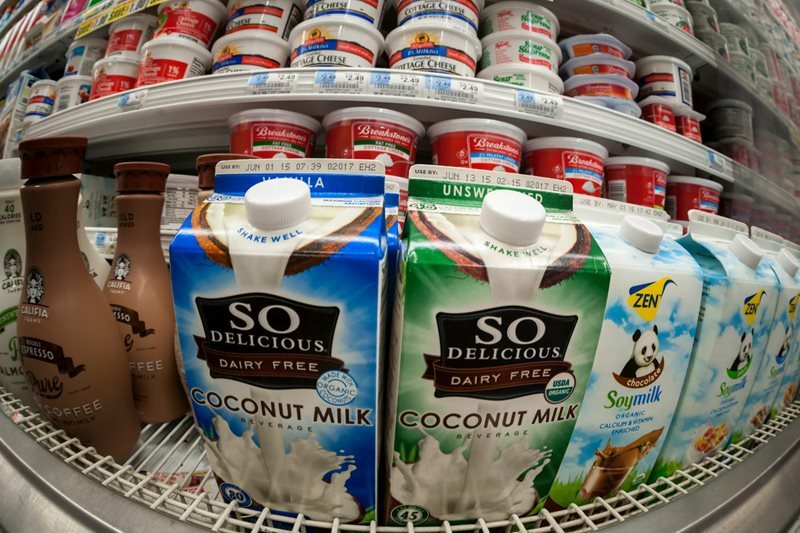 For a vegan recipe, replace the evaporated milk with coconut cream. in a medium saucepan over medium heat. Stir well and bring to a simmer, about 2 minutes. Stir until sugar is dissolved, about 1 minute more. Add the cinnamon, cardamom and vanilla. Stir in the cornstarch mixture and whisk for 3 to 4 minutes or until the mixture thickens slightly. Pour the sobia into a blender or food processor and process on high for 30 seconds to 1 minute. Pour into a container and refrigerate until totally chilled. Add in any optional garnishes and serve in a tall glass. Coconuts are so important to daily life in Zanzibar, from cultural traditions to trade, that historians through the ages have mistakenly thought that coconuts originated on the island. In fact, they were most likely brought by Arab merchants millennia ago. Curries, featuring the local red-curry powder, are often prepared with coconut milk as a base. If Zanzibar red curry is not easily found, make a substitute version using the recipe below. Season the fish fillets to taste with salt and pepper and set aside. Heat a large deep-frying pan over medium heat and add the coconut oil. Dredge the fish pieces in the cornstarch. Knock off any excess before gently placing the fillets in the oil. Fry until golden brown on both sides, about 4 to 6 minutes per side. Remove the fish fillets from pan and set aside on a plate lined with paper towels. Add more coconut oil to the pan as needed and sauté the onion and bell peppers until the onion begins to soften and become translucent, about 3 to 4 minutes. Add the garlic and fry 1 to 2 minutes more. well, frying for 1 minute. Pour in the tomatoes, coconut milk and tamarind syrup. Stir very well and lower heat to a simmer. Return the fish fillets to the pan and continue to simmer for 6 to 7 minutes or until the fish is cooked through and can be flaked easily with a fork. 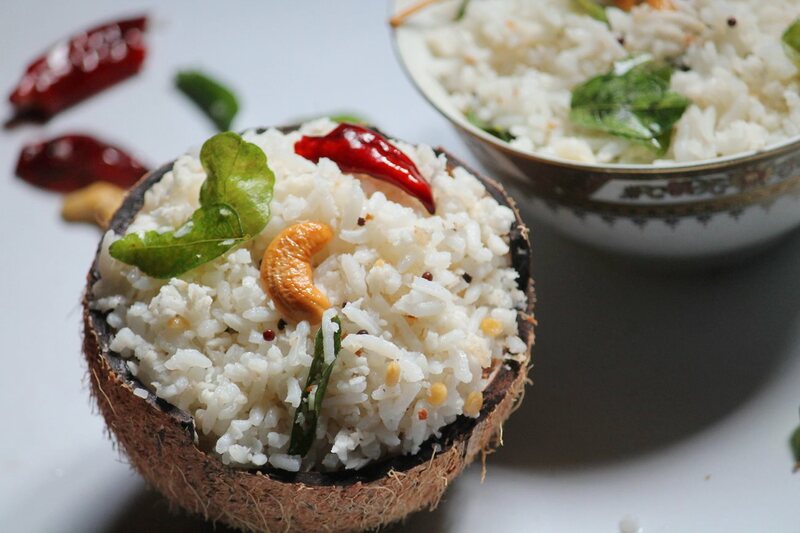 Serve over plain rice or coconut rice. 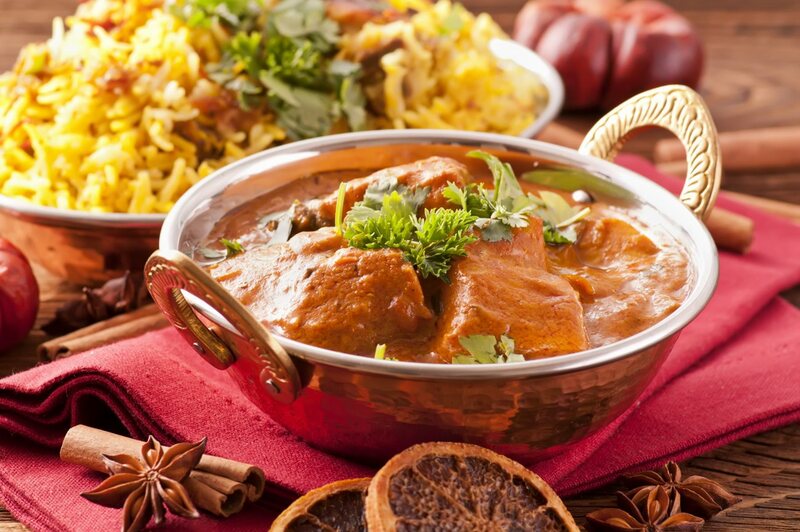 Chilies, which are ubiquitous in other African, Indian and Thai curries, are notably absent from the Zanzibari version of curry. If you prefer a spicy curry, feel free to add cayenne or other powdered chili pepper. If using whole cumin, fennel and coriander, grind the spices together in a clean spice or coffee grinder and set aside. Mix the ground cumin, fennel and coriander with the remaining ingredients and combine well. Store in an airtight jar. Hareesh, also called basbousa, is a dense cake made from semolina flour doused in sugar syrup and garnished with pistachios. Some versions, like this one, add coconut. (You may wish to use half of the syrup to start, and then determine if you want to use the whole batch.) Hareesh is perfect with hot black tea. Preheat the oven to 350°F (180°C). Grease a 20 cm cake pan. Combine the butter, cream, milk, yogurt and vanilla in a large bowl and whisk well until smooth. Whisk together in a medium bowl the semolina flour, coconut, sugar, baking powder, cardamom and lemon zest. Add to the milk mixture and whisk well until you have a very thick, smooth batter that can be cut with a knife. Add more semolina—a spoonful at a time— if needed. Pour the batter into the prepared pan. Dip a sharp paring knife in hot water and use it to cut a pattern of squares or diamonds that are about 3 x 3 cm (see photo) in the batter. Bake the hareesh for 30 to 40 minutes, or until it is golden brown and firm to the touch. tester inserted into the center should come out clean. If the hareesh isn’t browned but is cooked through, place it under the broiler for 30 seconds to 1 minute. Cool for 10 minutes, then run a knife along the score lines. While the hareesh is baking, prepare the syrup: Combine the sugar and water in a medium saucepan and bring to a boil over high heat. Reduce the heat to medium and simmer until the mixture becomes a syrup, about 8 to 10 minutes. Remove from the heat, stir in the rosewater and lemon juice, and allow to cool to room temperature. Pour the syrup over hot hareesh. Decorate each square of hareesh with the crushed pistachios. Allow to cool, then serve and enjoy. This is a popular recipe in South India, where coconuts are used in a variety of vegetarian dishes. This recipe also works well with cold, leftover rice. Make the rice: Place the rice in a bowl and add 2 cups of water. Using your hand, swirl around the rice until the water becomes cloudy and gently drain the water. Repeat 5 times and set aside. Bring 2 cups of water to a boil in a medium saucepan with the salt and 1 teaspoon of the coconut oil. Add the washed and drained rice, bring back to a boil and lower heat to simmer for 25 minutes. Drain in a colander if necessary; set aside to cool. Heat the remaining oil in a large frying pan or wok over medium low heat and add the ginger and asafetida. Fry for 10 to 15 seconds before adding the mustard seeds. When the mustard seeds begin to pop, in about 1 minute, add the channa dal or split peas, cashews and red chilies. Fry, stirring until the channa and cashews begin to lightly brown, about 2 minutes. Stir in the curry leaves and fry them for 1 minute. Then add the coconut. Mix well and fry, stirring until the coconut begins to brown lightly, about 3 to 4 minutes. Add the cooked rice to the pan and mix gently so that the coconut mixture is well distributed. Season to taste with salt as needed.